Among these Top 100 hopefuls is a wily vet as old as Old Glory itself, and a course so green it's not even complete. Here's a glimpse of some A-listers in the making. Consistently overshadowed by its Monterey Bay neighbors, The Preserve is an inland, mountain-meadow creation high in the hills above the Pacific and practically dwarfed by the 20,000 acres of the Santa Lucia Preserve. Its holes are crisscrossed with creeks and bracketed by live oaks. Featuring a Tom Fazio design and a Michael Poellot routing, this 17-year-old track is gaining new fans thanks to a 2016–17 renovation that yielded firmer, faster fairways, resculpted and repositioned bunkers and enhanced playability. 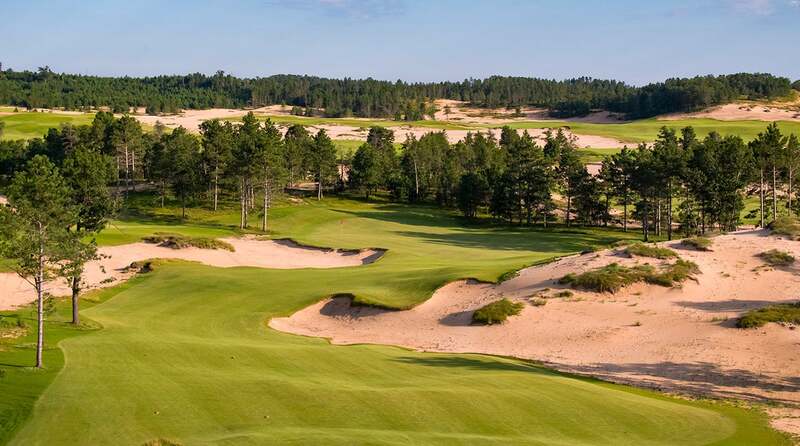 Sand Valley's second 18 looms large for 2018. Designed by David McLay Kidd, the aptly named Mammoth Dunes sits on a massive, 620-acre plot. It features more dramatic terrain than the resort's namesake track (U.S., No. 52), including an 80-foot, V-shaped ridge that gives rise to Ballybunion-like sandhills. At press time, nine holes had opened for preview play, a tease of things to come. Missing this year's U.S. Top 100 by a whisker is this ever-improving 56-year-old spread, which has been a Tour mainstay since 1969. Its fortunes have soared following a string of Tom Fazio renovations, including three new holes crafted in time for Justin Thomas's victory in the 2017 PGA Championship. The changes fit seamlessly into rolling terrain framed by hardwoods and dotted with lakes and creeks. Admired by panelists and pros alike is a gorgeous but stern trio of closing holes. Dubbed the "Green Mile," they tempt and torture in equal measure. Look for Quail Hollow to crack the Top 100 next time around. This ancient layout is the sixth-oldest club in golf, dating to 1780. But every year, thanks to course tweaks by architect Martin Hawtree, it gains new admirers. Host to the 2005 Senior British Open (winner: Tom Watson), the 2011 Walker Cup (Hail, Britannia and Ireland) and the 2014 Scottish Open (way to go, Rosie), this tournament-tested links climbed 14 spots in 2017 to No. 106 in the World. Keep an eye on it for 2019. With neighbors that include Ballybunion and Waterville, it's not easy for a new course to make an impact in Southwest Ireland, but Hogs Head, which is slated to open in 2018, has the potential to do just that. Robert Trent Jones II forged an entirely new track atop the defunct Skellig Bay layout, which lasted a mere 11 years. Hogs Head boasts a front nine with holes that tangle with the Finglas River, a superb stretch (8–16) that overlooks the Atlantic, and architectural nods to MacKenzie, Tillinghast and Colt.